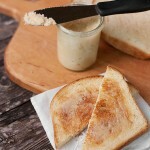 This maple butter is great on toast, pancakes, muffins, scones or just about anywhere you would use butter. You will need a candy or other thermometer for this recipe. In a medium saucepan, add maple syrup and pinch of salt and cinnamon. Heat maple syrup over high heat until boiling (*be sure to use a large-ish pan, as syrup will boil up about double or more). Attach or insert thermometer and boil until syrup reaches 240° Immediately remove from heat and stir in butter until it's completely melted. Pour mixture into the bowl of a stand mixer or alternately, use a large bowl with a hand mixer. Start on low speed and gradually increase speed until you reach high. Continue to beat on high until mixture is lightened and creamy, about 8-10 minutes total. (Mixture will still be a bit runny at this point. Don't worry, it will firm up in the fridge.) Pour into a jar or bowl, cover and refrigerate. If your maple butter has separated after cooling (leaving a layer of butter on tosimply stir the butter back in to incorporate. Maple butter will keep refrigerated in an air-tight container about 2 weeks.